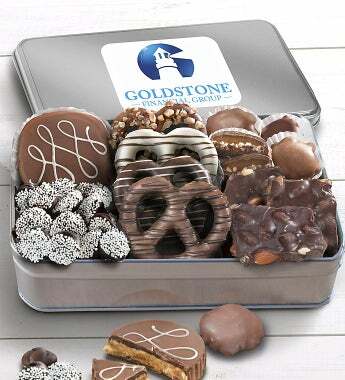 Classic chocolate favorites from Simply Chocolate are artfully arranged in this sleek silver tin. They'll love the giant chocolate peanut butter cup, chocolate covered pretzels, chocolate nonpareils, chocolate caramel pecan clusters and more. Gift measures 10.5" x 6.75" x 2"
Classic chocolate favorites from Simply Chocolate are artfully arranged in this sleek silver tin. They'll love the giant chocolate peanut butter cup, chocolate covered pretzels, chocolate non pareils, chocolate caramel pecan clusters and more.